Dr. Bobbi Stanley began her dental practice in Cary with a goal of providing superior dental services. 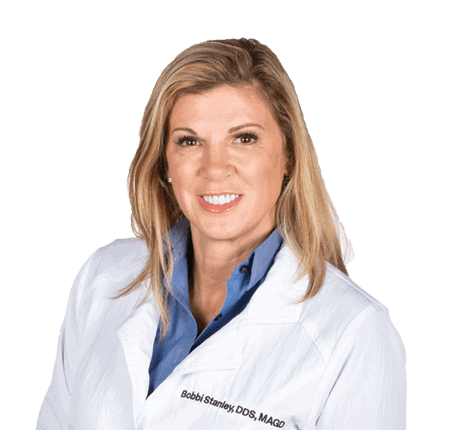 Dr. Bobbi Stanley graduated from the University of North Carolina School of Dentistry in 1993 and continues to be an avid learner, attending countless hours of continuing education. She also believes providing superior dental services means using the best materials on the market with the highest technology available. She is a Master in the Academy of General Dentistry (MAGD), a Diplomate in the International Congress of Oral Implantologists (DICOI) and a Fellow at the prestigious Las Vegas Institute for Advanced Dental Studies (LVI). She is a Sustaining Member of the American Academy of Cosmetic Dentistry (AACD), the International College of Cranio-Mandibular Orthopedics (ICCMO), the International Association of Orthodontics (IAO) and is a Qualified Member of the Crown Council. Additionally, Dr. Stanley is a member of the American Dental Association (ADA), the Raleigh-Wake County Dental Society, the North Carolina Dental Society, the American Academy of Women Dentists (AAWD) and the Dental Organization for Conscious Sedation (DOCS). Dr. Stanley is an Adjunct Professor in the Department of Prosthodontics at her alma mater, the University of North Carolina at Chapel Hill School of Dentistry. She is Co-Founder and Senior Instructor at Stanley Institute for Comprehensive Dentistry in Cary, NC and a Senior Instructor at the International Association of Orthodontics in Milwaukee, Wisconsin and The Facial Beauty Institute in Memphis, Tennessee. Dr. Stanley’s personal philosophy is not only to live life but also to live it to the fullest. Her motivation to be the best in her field is matched only by her desire to be a great wife and loving mother of her four children. In 2017, Dr. Bobbi completed one of her bucket list items by successfully finishing the Louisville Ironman Triathlon. Dr. Bobbi recently got her private pilot license and is working on her instrument rating. Dr. Bobbi completed her first Ironman Triathlon in October 2017. She and Dr. Rob enjoy spending time and traveling with their four children.